In this article we will take a technical look at what Hibiscus' share price is doing. This is another stock that I have not look at for a very long time. It does provide an interesting picture right now as it is trying to breakout higher and start a new uptrend. Chart tells us lots of stories...that is if you pay attention and learn to read what price action is telling us. 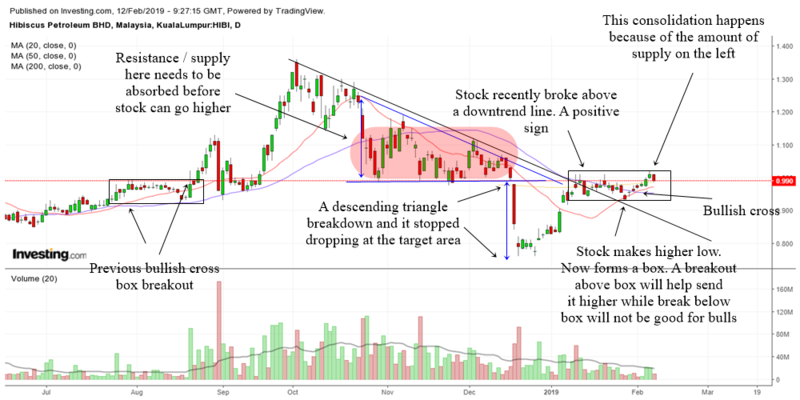 The stock had a daily bullish cross box breakout back in August 2018 and it rode higher till October 2018 but then it collapsed all the way down to mid December where it bottomed. It is interesting to note that the descending triangle provided a target for the sell off. And it did really stop going down once the target is almost met. First of all the stock has broken a downtrend line. This is a positive development as stocks that break a downtrend line signal to us that it wants to go higher. However, the stock did not immediately shoot up higher. This is because there is a heavy amount of resistance on the left. I call it supply. The area I colored in red is where lots of people lost money and guess what they will do when price goes back there? They sell to get out breakeven or at least not losing that much. Therefore, it needs some time for the supply to be absorbed. Which is why the stock traded sideways. This consolidation is setting up a box and you will notice a bullish cross as well. The box can be used to guide us. If it breaks out of the box, then the stock is likely to go higher although I must say probably in an up and down wave because of the resistance overhead. On the other hand, if the stock drops below the box then we can expect weakness in the stock. Hibiscus got a bit overbought with the stochastics overbought and thus the sell off. Currently the daily stochastics are still in a sell mode. A reference area of support would be around the 200 MA area. The 60 min chart shows us that Hibiscus is still in a weak bearish downtrend and thus not conducive for longs yet. A possible target would be the 60 min double top target. As price reaches there might want to see if stock can bounce back up. 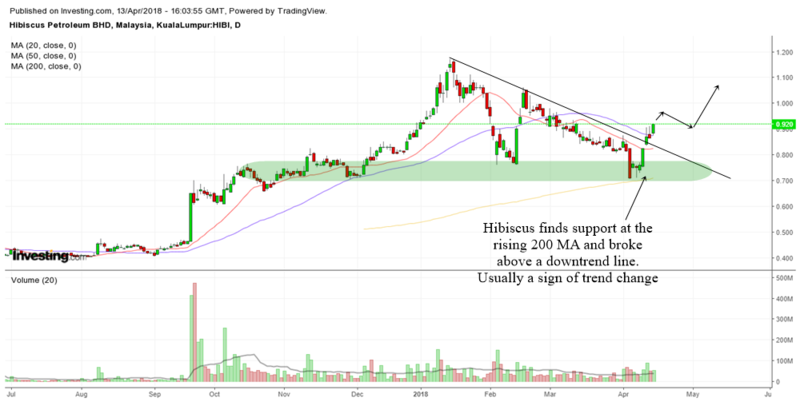 Hibiscus Petroleum is one of those stocks that has been able to find support at price support as well as its rising 200 MA. The area above which I have highlighted in green is a major support area for the stock. One thing that I like about this stock is that it has been able to trade back up above the downtrend line. Usually this is an early sign of a trend change. From correction to basing to the start of a new stage 2 uptrend. If oil prices continue to rise perhaps Hibiscus will continue to rise. I'm assuming that Hibiscus has something to do with oil so hence that conclusion. I do not trade this stock so I'm not aware of what it does. Just commenting it from a TA point of view. The stock has been in a 60 min downtrend for quite a long time until it formed an ascending triangle bottom. The pattern marked the bottom and it rapidly shot up and is still staying above the rising 20 MA. The 20 MA will be a good gauge of the short term trend and momentum of this stock. We can assume that it will continue to rise as long as it is above the 20 MA but once it drops below it we need to be careful. Hibiscus along with other oil stocks had a big correction. I remember the last time I look at it I asked you to use the 60 min charts to gauge the trend of the stock. The chart above is the 60 min chart of Hibiscus. The stock gave out many warnings signs that it will collapse. First of all, it broke below support, then it broke below the 20 MA and 50 MA and then it broke below an uptrendline. This is usually signs of a change in trend and therefore the realistic short term trader will take profits. At this moment, the stock is dropping to an area of support. However, you should still be very cautious because there is no change in trend in the 60 min time frame yet. As long as the stock stays below the 60 min 20 MA, I would caution you not to touch this stock yet. You should wait for it to stabilize first. The chart above shows the daily chart of Hibiscus. Even in the daily chart, the stock is telling people that it wants to correct. First of all it broke below an uptrendline, secondly it broke below the 20 MA. That is a warning sign for investors to be cautious. At this moment the stock is correcting to the support area and the 50 MA. Usually this is a place where investors can buy the stock cheaper. But you will need to see it stabilize first before entering again. With such a strong uptrend in the daily chart, will the bull run in Hibiscus continue? Let us look at what the charts are telling us. The chart above is the daily chart of Hibiscus Petroleum. As you can see, the stock broke out of a daily ascending triangle pattern in November 2017. Although the pattern was a success, investors still saw some correction in the chart. There was no violation of the pattern as the stock did not fall below the pattern. Hibiscus found support at its rising 50 day moving average and continued to shoot higher. Prior to the formation of the ascending triangle, the stock had a big green bar day on heavy volume in September 2017. This was a hint that there was heavy buying interest in the stock. Therefore, when the ascending triangle formed, we can tell that there was firepower behind this stock to send it higher. 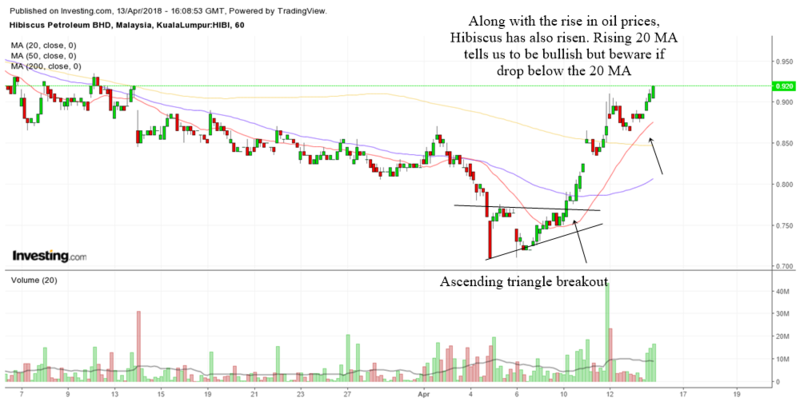 Hibiscus broke out of the ascending triangle and has more than met its initial target. When a stock is in an uptrend, they can often overshoot an initial target. Currently the stock is still in a very nice uptrend. It has gone up a lot and usually, I will be quite cautious of any stock that I hold that have gone up a lot. But I do not have blind pessimism. To gauge the strength of the stock I will look into the 60 min charts to watch for any sign of weakness. As is pretty evident, the stock is in a very very nice 60 min uptrend. If you are a short term trader, there were plenty of opportunities to buy the stock as it trended higher in the 60 min chart. I have pointed out the buying areas using the blue arrows. The first 3 was a 60 min box breakout. The 4th one was a break downtrendline play and the 5th one was a 60 min ascending triangle. No doubt there will be plenty of ways to enter. But those are the entries that I know. What I can say about Hibiscus right now is I'm cautious that it has gone up a lot in the daily chart. But I'm still bullish when I look at the 60 min chart. The simple reason is because the stock has not shown any weaknesses yet that I can see. It is still trading above its rising 60 min 20 MA and 50 MA. Those are the red lines and blue lines on the chart. When the stock starts to drop below the 20 MA, I will be cautious and when it drops below the 50 MA I would be very very cautious of a trend change. That is a simple trend following method when a stock is trending up. I find it useful to use the 20 MA and 50 MA and each trader will have their own special way to catch the trend. When a stock is trending up in the daily chart and 60 min chart, I always like to look for any possible resistance in a higher time frame. To do so, I switch to the weekly chart which is the chart you can see above. There is a very heavy and strong resistance around 1.35 to 1.40 area and if it ever reaches there, usually I will sell 1/2 or 1/3 of any remaining position. At this moment the stock is still trending up and there might be a small resistance with the tiny congestion area in the weekly chart. But if the 60 min trend continues to be up and if the stock continues to form continuation patterns in the 60 min chart I consider the small resistance to be easily overcome. But the 1.35 to 1.40 area might not be so easy to overcome. For that I would prefer some consolidation in the daily charts and find a breakout to trade. It pays to be simple and follow the trend.